Exploring technology that affects how we experience the world. Wi-Charge transmitter sends power over focused beams of invisible infrared light. The technology from Wi-Charge takes the current capabilities of wireless charging and delivers freedom from power outlets and battery changes. Wi-Charge transmitters are small and transmit power using only safe invisible light, sending plenty of power to charge a phone across a room or provide enough to let mobile and Internet of Things (IoT) devices appear to charge autonomously. The Wi-Charge system is different from the wireless charging that users are familiar with that uses inductive charging and is limited to distances of up to 4 cm (about 1-1/2 inches), instead using focused beams of invisible infrared light. Transmitters connect to a standard power source and deliver power to nearby receivers, automatically identifying chargeable devices and their power requirements. Receivers can be embedded in mobile devices or connected into an existing charging port and use a small photovoltaic cell to convert transmitted light into electrical power. 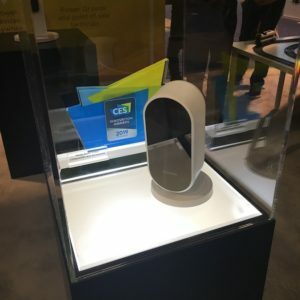 At CES 2019, Wi-Charge is demonstrating a proof-of-concept of how long-range wireless power technology can supply the energy to run a Schlage smart lock as part of an Alarm.com smart home security system – without any wired power or pre-charged batteries. 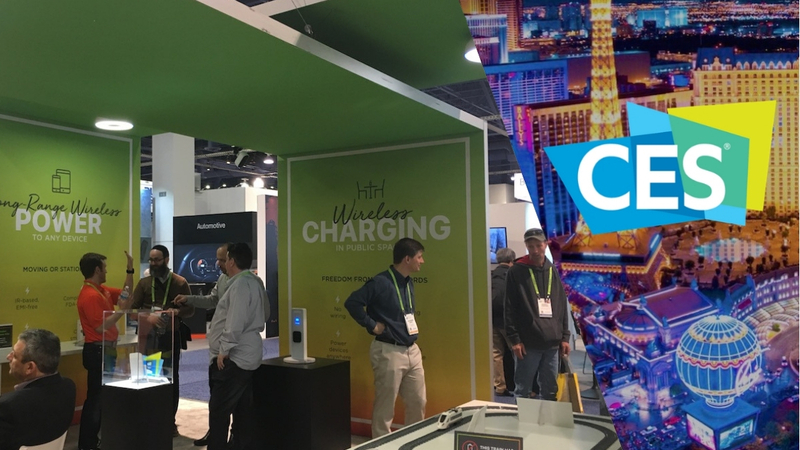 Wi-Charge is collaborating with innovators in the smart home security and automation ecosystem industries to enable the next generation of smart home devices. 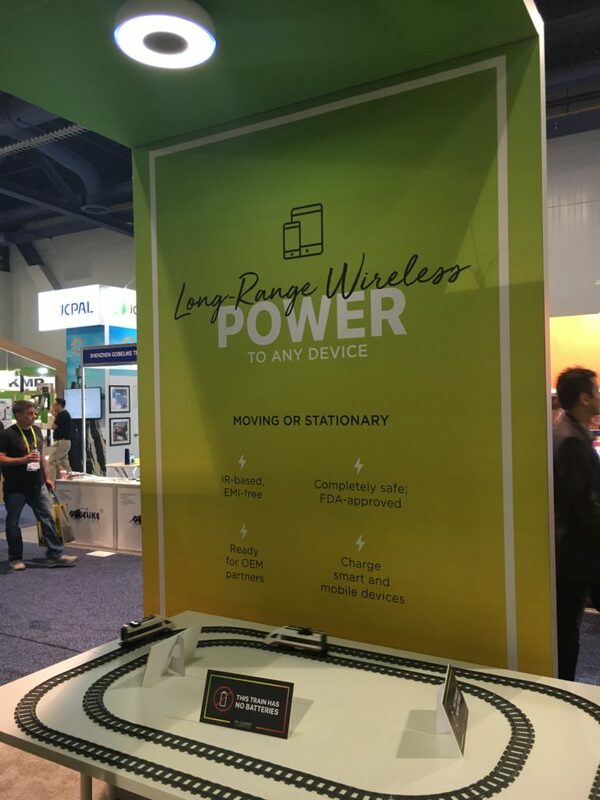 Untethered, wireless power will usher in a new era of devices and use cases for consumers that have previously been limited or restricted by power cables and batteries. The demo of Wi-Charge transmitter in the light above is powering the toy train on the table. The concept of wireless power for devices has been a point of interest for The Architechnologist since our first trip to CES back in 2011 when we met with the team from Fulton Innovation and eCoupled, years before the creation of the now ubiquitous Qi standard (Wireless Power Up Again with Fulton Innovation and eCoupled, The Architechnologist, 6 January 2013). Qi technology has certainly been adopted by most consumer electronics, the light-based power supply of Wi-Charge could very well be the next big evolution of power supply. Future installations could provide wireless recharge to phones of everyone in a coffee shop, or supply power to security cameras, thermostats and other IoT devices without the need to run power. More information about the Wi-Charge technology, and the devices it can be found in, can be found at www.wi-charge.com.